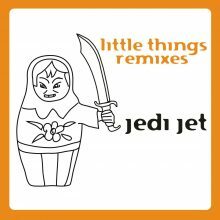 Jedi Jet’s mini album „Little Things“ already proved the wide range of unconvential house productions the two Croatians stand for. And the choice of remixers goes in the same direction. New Mo’s Ferry talents like Patrick Vano or Greenbeam & Leon as well as old fellows on the label give their personal touch to the album tracks. From more techno-ish beats to even more experimental sound design to new harmonic surroundings the release of the five remixes doesn’t want to fit in a single drawer – and that’s totally the intention.